Time for flu shots. The Centers for Disease Control and Prevention recommends that everyone get immunized with a yearly flu vaccine. According to health officials from the Centers for Disease Control and Prevention (CDC-P), there were about 80,000 deaths nationwide with over 900,000 hospitalizations resulting from last year’s flu season (2017-2018). North Carolina recorded 389 deaths. This made last year the worse flu season in decades. In an attempt to prevent a bad flu season from recurring, the CDC-P recommends that everyone get a yearly flu vaccine for two important reasons. First, your body’s immune response from the flu vaccine declines over time, so last year’s flu vaccine may not protect you from flu this year. Second, flu viruses are constantly changing so the formulation of the flu vaccine is reviewed and updated as needed for the best coverage each year. The formulation of the vaccine may not be perfect, but it is the best scientific “hypothesis” to match the flu viruses that will circulate and make you sick this year. Influenza (flu) is a contagious respiratory illness caused by influenza viruses that infect the nose, throat and lungs. It can cause mild to severe illness or could possibly lead to hospitalizations or death. Symptoms include some (or all) of the following: fever, cough, sore throat, runny or stuffy nose, muscle or body aches, headaches, fatigue or vomiting and diarrhea. Symptoms start one to four days after the virus enters the body. Complications from the flu include: pneumonia, ear infections, sinus infections, dehydration and worsening of certain medical conditions, such as congestive heart failure, asthma or diabetes. “Flu season” in the United States usually runs from October until late May (flu illnesses are highest January through March). 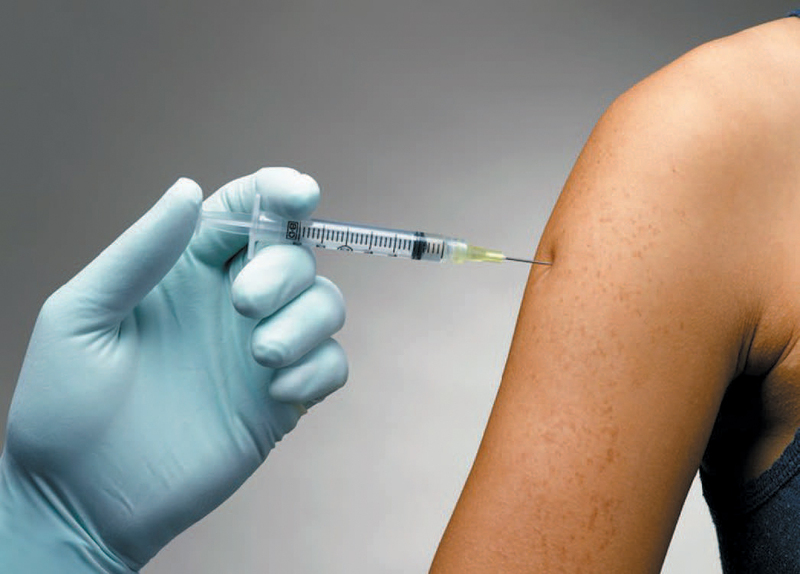 The seasonal flu vaccine contains the influenza viruses that research indicates will be the most likely to circulate this flu season. The viruses in the vaccine are dead, so it cannot give you the flu. But, you may have a mild fever or a sore arm at the injection site. The vaccine tricks your body into thinking that it has been exposed to the flu and your body makes antibodies to fight the virus if exposed to it again. Your body needs about two weeks to make antibodies to protect you from getting sick. People with the flu can easily spread it to others. Flu viruses spread mainly by droplets made when people infected with the flu cough, sneeze or talk. People who have certain medical conditions including asthma, diabetes and chronic lung disease, including their household contacts and caregivers. People younger than five years (especially those younger than age two) and people over age 65, including their household contacts and caregivers. If you have questions about the flu or the flu vaccine, you should contact your health care provider, the Guilford County Department of Health and Human Services, Public Health Division at (336) 641-7777 or www.guilfordcountync.gov, or visit the CDC at www.cdc.gov.